Photos in Ama Dablam slideshow: Chris Kinny, Dan Mazur, Guan-Jang Wu, Joanne Goodson, Tom Lannamann, Scott Darsney, & Valerie Hovland. 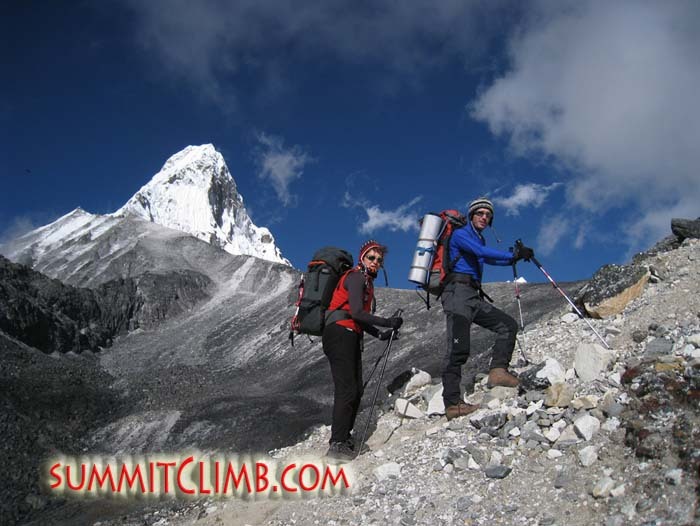 For caption information, please visit our Ama Dablam photo gallery. 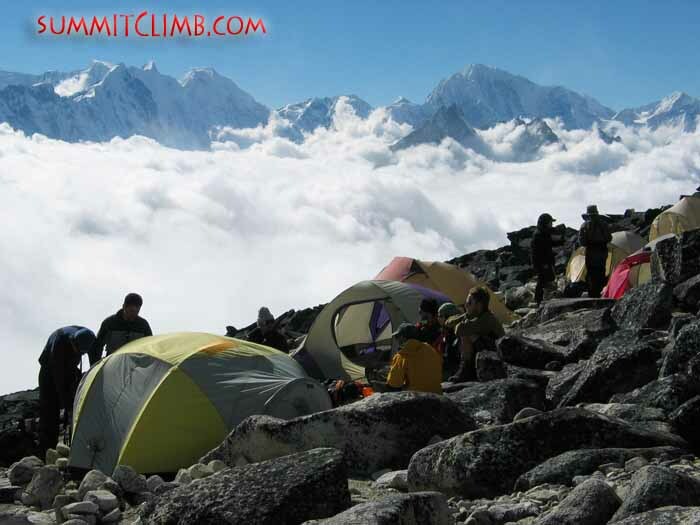 Hello SummitClimb news readers. Sorry for the long delay. Everyone is back in Kathmandu or safely home, except for Czech Tony who is still out trekking in the Khumbu. Tony Kortens, Penelope , Kyle, Pete, and I went to Chitwan National Park after leaving Ama Dablam. I'll have some photos of that coming soon. I have been quite busy taking care of the final details and will send a full final dispatch from Bangkok after I arrive and get some sleep. Team members in Namche Bazaar, heading to Lukla. Hi, this is Jason Thomas the leader of the SummitClimb Ama Dablam expedition calling in from Namche Bazaar for the 26th of October. We’re in Namche Bazaar. Everybody is doing well. We have been trekking around outside the village today. 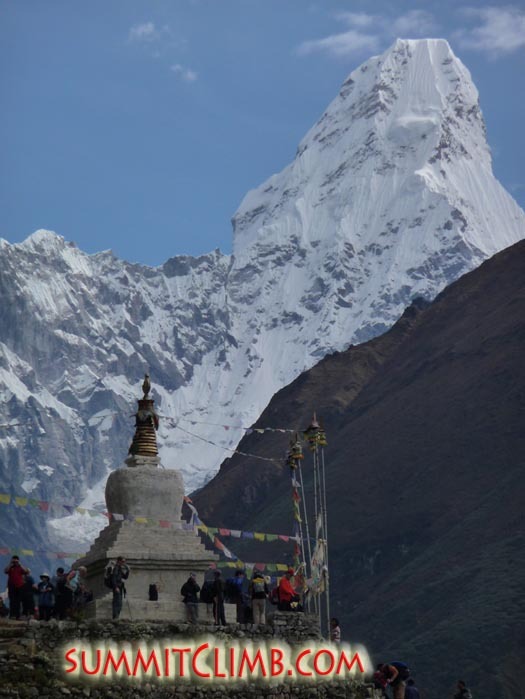 It’s been beautiful, with crystal clear skies and views of the surrounding Himalaya, including Ama Dablam. Last night we went out to explore the village and had a delicious dinner. We had a really good time and stayed out fairly late celebrating together. It may be the most dangerous part of the trip trying to find your way back to the teahouse we’re staying in late at night, stumbling through the streets of Namche in the dark. Everybody is well. We’re going to hike to Lukla tomorrow and catch a plane first thing in the morning back to Kathmandu. The Tibetans are back trading in Namche and we checked that out yesterday. There were some really cool and interesting goods we looked at in the market. Some members bought some souvenirs to take back to their family and friends. Kyle is sitting here with me right now and wishes to say hello to his family and friends back home. 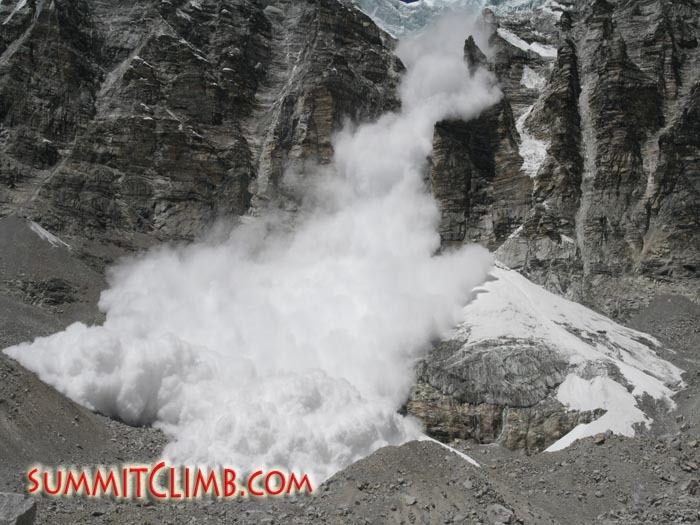 Jeanot Boulet reports about the Dablam avalanches. On the 17th of October I was climbing together with Mihael to camp 1. During the night we heard an avalanche coming down from Ama Dablam, but we were safe in camp 1. The next day, on the 18th, the weather was cloudy, it had snowed and there was some wind. Mihael and I decided to continue to camp 2 for our acclimatisation. 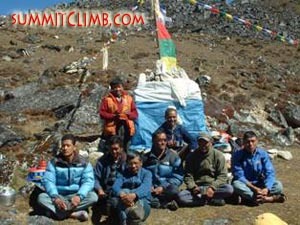 Together with 1 of the sherpas we left camp 1 around 09.00. We climbed the ridge from camp 1 to camp 2. At around 12.30 we were just below camp 2, Mihael a bit further. I was taking a small rest at that point and looked up to the upper slopes and the serac of Ama Dablam. Just as I looked up, I heard a big crack and saw a huge part of the right hand side of the serac collapsing. This triggord an enormous avalanche and wiped the whole upper slope clean, as well as the site of camp 3. Instead of the deep snow encountered before, the slope was now bare, blue ice. I took some photos of it as it passed me on a few hundred metres away. We were lucky that the route hadn't been fixed higher than camp 2 or else climbers of our team may have been on the route and wiped away. We made a radio call to Jason in BC and told him we were safe. We continued the climb till camp 2 and descended that same day. 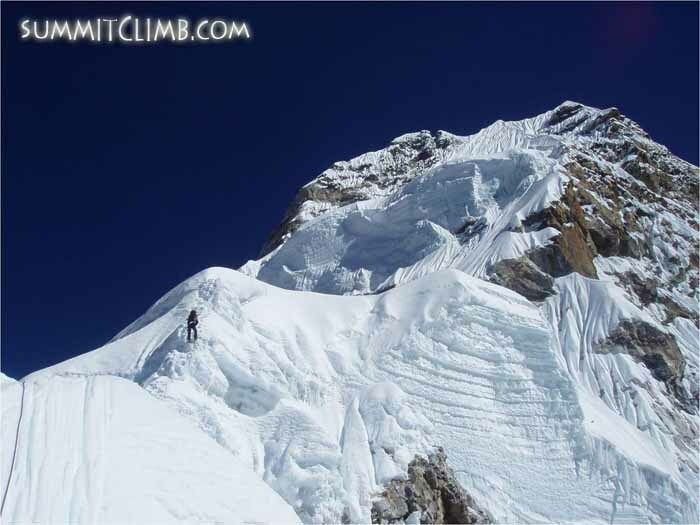 During the following night, another avalanche and even more came of from the Dablam. 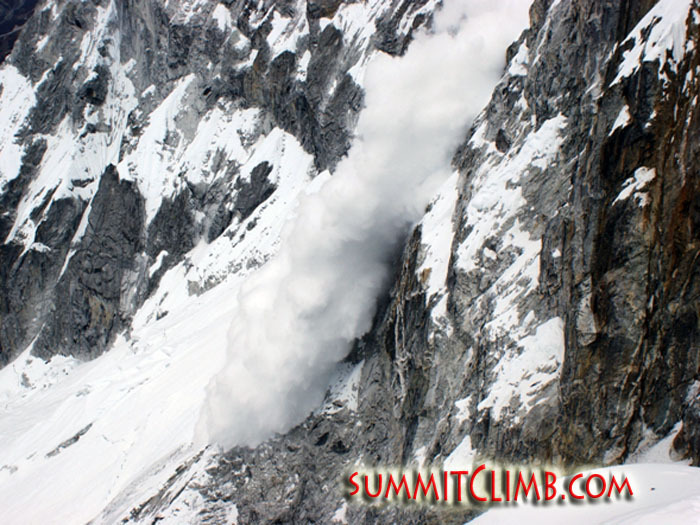 Images of the avalanche that Jeanot witnessed where the Dablam fell off and wiped out camp 3 (Jeanot Boulet). Hi, this is Jason Thomas the leader of the SummitClimb Ama Dablam expedition calling in from Pangboche for the 24th of October. In Pangboche right now with me is Penelope, Tony from San Francisco via New Zealand, Reinhold from Germany, Kyle from Boulder, and Brent and his wife Kori from Seattle. We’re all down here at the lodge in Pangboche. The expedition is now winding down. 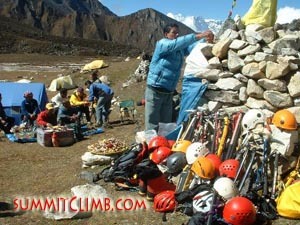 All of the equipment and sherpas will be leaving from basecamp tomorrow. We came down here early to hang out by the hot stove, get comfortable, and have a beer or two. 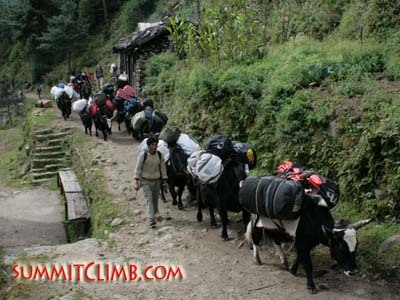 Tomorrow we’re going to hike to Namche and the sherpas and yaks will meet us there with all of our equipment. Then we’ll all hike to Lukla. We should be flying out of Lukla on the 26th or 27th depending on the yaks. Everything is going well. Tony from the Czech Republic, via Australia, is going to stick around and do some climbing or trekking in the Khumbu on his own, but everybody else is heading back to Kathmandu. Some members might go to Chitwan National Park or do some rafting. We’re not sure yet, but we’ll keep you informed. Everything is going well. It’s kind of sweet sorrow to leave the expedition without going to the summit, but all in all it’s been a good trip and everybody is leaving safe and sound, which is great. It’s a success in that way. Team members getting ready to trek out of basecamp. Hi, this is Jason Thomas the leader of the SummitClimb Ama Dablam expedition calling in from basecamp for the 23rd of October. Everything is going great. The last few members are strolling back into basecamp. They climbed up yesterday and slept in camp 1. Today they climbed up towards the Mushroom Ridge. Some members made it and some didn’t, but a lot of them got to climb the Grey Tower, which is a steep section of ice and mixed rock climbing above the Yellow Tower, close to 6000 metres/20,000 feet. Everybody got a chance to attempt some steep climbing at altitude, so are pretty excited about that. All of the members should be down tonight except for Tony from the Czech Republic. He’s at camp 2 and going to spend the night there and come down tomorrow. As I speak, Reinhold and Brent are about 10 minutes away from camp. I’m watching their headlamps bounce up and down the trail here. They are doing fine, but a little tired. In some other news, some Romanians tried to summit today. They used our fixed lines up to camp 3 and then tried to climb the remainder of the route alpine style. We watched them all day and they moved pretty slowly because it was a party of 3, but they got turned around in the upper snow field because I think the snow was too deep. I’m watching their headlamps high up on the face right now, so we’re hoping they are going to be all right tonight. It’s cold out, so hopefully they’ve got some warm boots, good mittens, and they can keep on moving through the night. I’ll try to call tomorrow. Other than that, we’re going to try to head out of here on the 25th with yaks. 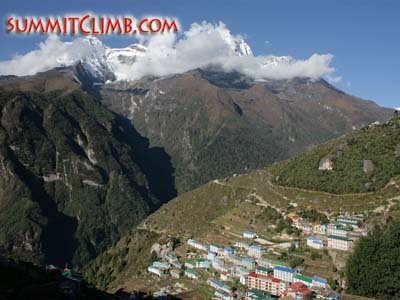 Some members may take off tomorrow and go do a little hiking and meet up in Namche. We’ll all hike back to Lukla as a group and fly out. Ama Dablam seen from camp 1 at 5700 metres/18,800 feet. Camp 2 at 6000 metres/19,800 feet (Nikos Daniilidis). Team members climbing up to the Mushroom Ridge one last time. Hi, this is Jason Thomas the leader of the SummitClimb Ama Dablam expedition calling in from basecamp for the 22nd of October. As I said in my last message, we’re pulling the plug. Some members are going to climb up to the Mushroom Ridge tomorrow just to see what the climbing is like. It is really good climbing up to that point, so they are excited to get a bit more in before leaving. The majority of the climbing is from camp 1 to camp 3, so they are going to try it out. That team will include Ms. Penelope from Greece, Tony who is originally from New Zealand and now lives in San Francisco, Tony from the Czech Republic who now lives in Australia, Kyle from Boulder, Colorado, Brent from Seattle, and Reinhold from Frankfurt. They are all going to go climb as high as they safely can and then come back down tomorrow. A few of them may sleep up there tomorrow night then come down the following day, but I think the majority of them will be down tomorrow night. They have 5 sherpas up there with them. I’m down in basecamp getting the last details organized. On the 25th, we’re planning on leaving basecamp and have all of the tents packed up. We’re a little disappointed because of the big avalanche and being unable to go to the summit, but people have accepted it and are happy to do some climbing. We’ve all had a good time and made a lot of new friends. Some members might stay and walk around the Khumbu a little bit more, check out some other climbs, attempt some trekking peaks, and maybe do some trekking in other valleys. We’ll let you know how that goes. Uncertain climbing conditions. Valiant efforts, but the team is heading out. Hi, this is Jason Thomas the leader of the SummitClimb Ama Dablam expedition calling in from basecamp for the 21th of October. Here’s the update for what is going on here. We’re all down at basecamp. A couple of people went up to claim their equipment. We decided as a group we don’t want to put our sherpas at risk of getting hurt up there at all and we don’t want to put members up underneath the serac. There’s a chance that it could fall again. It looks like there is a bunch of loose stuff ready to come down and we don’t want to see anybody get hurt. Just to reiterate what happened; on the night of the 17th part of the Dablam fell off and the following day another huge section dropped, ripping out all of the snow below it, causing an avalanche, which was directly in the way of our route. Now it is all blue ice. Another serac fell off causing an avalanche again that night. Now the Dablam is about half of what it was when we got here. It was huge when we arrived and it just keeps breaking off and unfortunately it falls right in the way of our route. If somebody was up there 2 or 3 days ago when this happened they would be dead, no doubt about it. It’s pretty catastrophic what happened up there. Thank God there was nobody up there. It’s been really bad snow conditions, which kind of kept us from getting our sherpas up there. They have been working extremely hard. I gave them a rest day while the avalanches happened, which was also very lucky. Thank God. If there was fixed lines up there, climbers would have been ripped off the mountain. We could have had a tragedy like what happened a few months ago on K2. It didn’t happen though because I guess timing is everything. We’ve decided as a group not to put anybody in danger. Most of the members are pretty psyched not to go up there and possibly get hurt and not to continue climbing the mountain. There are some other teams still here. Some have already left. Some of them just got here and didn’t see the destruction. It’s probably an out of sight, out of mind thing. They’ll probably continue to climb and I hope them the best, but it’s pretty dangerous right now with lots of loose ice in the seracs that keeps coming down. On a good note, our sherpas did fix the route all the way to camp 3 yesterday. I’m sure the other teams that show up later will use our ropes. They worked really hard to overwork a huge cornice on the Mushroom Ridge to get up there. Unfortunately it’s kind of in vain because we’ve decided to not go up and we don’t want to put people in danger. Ama Dablam seems like it’s changing a lot. We’ll see how things go over the next couple of days. We’re going to watch it. I’m sure there is going to be some more ice coming down. The sherpas at ABC said they could see chunks of ice today. If somebody is up there they could get hit by one of those chunks. We just want to keep everybody safe. That’s our main priority. Ama Dablam is not going anywhere. Maybe next year we’ll come back and have better luck with it. Mitch from Salt Lake City has left, Christoph from Switzerland has left, and Dave is going to leave tomorrow. Some folks are going to go up and climb just above the Grey Tower and maybe up to the Mushroom Ridge just to see what it is like and stay out of the dangerous areas. That would be Brent, Pete, and Kyle. They are going up to see what it is like there without putting themselves in danger with the serac above. We’re having sherpas carry equipment down to basecamp for the remaining members who are going to hike out. We’ll have yaks coming in to take all of the group equipment out of here. That’s the way it goes on the mountain. Everybody is doing fine and safe. Things like this happen in the mountains and we don’t want any accidents, so we’re going to get out of here. Some members are going to go trekking with their remaining time, while others will head back to Kathmandu. I think we had a really great team this year and it was just the conditions that held us back. Our sherpas were the only climbers who could actually get on to the Mushroom Ridge this year and they climbed some pretty tough conditions to get up there. Nobody has been able to summit the mountain so far this season. Avalanche sweeping down the mountain in the Khumbu Valley near Everest Basecamp (John Dowd). 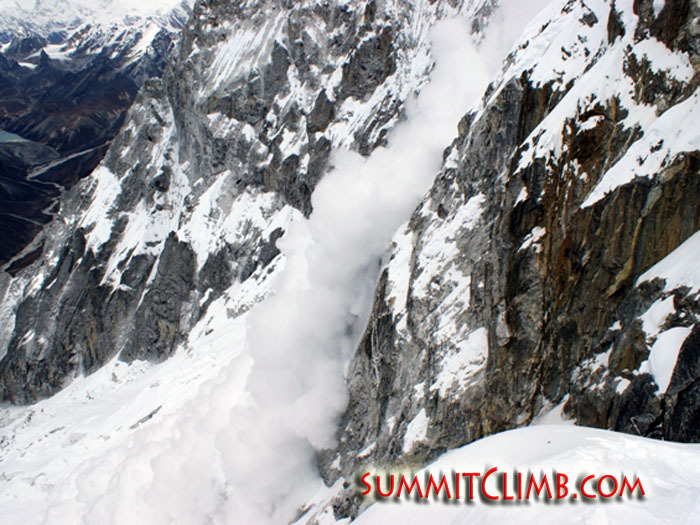 Huge avalanches above camp 3. Half of the Dablam fallen off. Hi, this is Jason Thomas the leader of the SummitClimb Ama Dablam expedition calling in from basecamp for the 20th of October. We’re still waiting, but there have been some new developments. Big chunks of the Dablam have fallen off. There’s been at least 3 serac avalanches that wiped the whole slope clean above camp 3 and has probably taken out camp 3 as well. We’re keeping a really close eye on that to see what happens. We’re going to walk to the Dablam to see if more ice and snow is coming off, but right now it is looking pretty unstable. Probably half of the mass of the Dablam has come off in the last 30 hours. We have sherpas up there working, still trying to get on to the Mushroom Ridge and we’re going to go from there. The snow slope leading up to the Dablam is now sheer blue ice instead of snow, so it’s going to be a little more difficult. We’re pushing on carefully and seeing what is happening. Everyone is still waiting. Some groups have sort of given up, but we’re going to push a little bit further and see how it goes. Some members have decided not to climb. Some members are sticking around to see what will happen. Otherwise, we’re just trying to keep safe. We had another beautiful day here in basecamp with nothing but great weather. We had a little dusting of snow, but other than that it’s just been great sunny weather. Thank goodness nobody was able to get up towards camp 3 over the past few days because if they had the Dablam may have taken them out. So, things have been working in our favour and we’re going to keep safely trying to work up the mountain. Looking up towards the infamous Mushroom Ridge at 6150 metres/20,300 feet (Valerie Hovland). Hi, this is Jason Thomas the leader of the SummitClimb Ama Dablam expedition calling in from basecamp for the 19th of October. Everything is going well. We’re still just waiting. The sherpas have been sent up and they are now in camp 2. Tomorrow morning they’re going to try to push the route if they can. Pretty much all of the members except Christoph and Mitch are down either in basecamp or even lower in Pheriche and Tengboche. Christoph and Mitch went on a little hike earlier to camp 2 today, so they are still acclimatizing a bit and they’ll be back down either tonight or tomorrow morning. We’re still just in a holding pattern. We have our fingers crossed that our sherpas can get the ropes up and we’ll get a chance to climb. I’ll let you know more tomorrow. The sherpas are going to call me as soon as they get up there. We’re still trying to fix the route up over the Mushroom Ridge. There have been problems so far, but it won’t be a problem if they can get up there. Our comfortable basecamp (Nikos Daniilidis). Team members trekking below basecamp (Nikos Daniilidis). Final members acclimatizing in high camps. 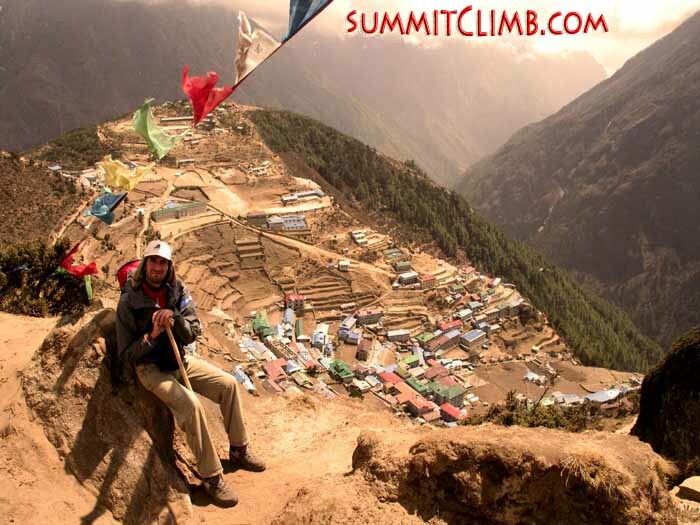 Hi, this is Jason Thomas the leader of the SummitClimb Ama Dablam expedition calling in from basecamp for the 18th of October. There are 2 members up at camp 1 right now, making their way to camp 2 for their final acclimatization. There are 2 members, Mitch and Christoph, who are heading up today to do their final acclimatization. The rest of the group has done their final acclimatization to camp 2. Now we’re just in a holding pattern waiting for some ropes to get fixed. Nobody has summited yet on Ama Dablam and it seems like all of the other teams are waiting on us to fix the ropes. Our sherpas just went back up to try to fix the ropes. They’ll start fixing again in about 2 days when they get there on Monday morning. A lot of members have gone down to Tengboche and Pheriche to use the internet, phones, and relax. The Italian team has pulled out, the German team has pulled out, the American team pulled out early on, the Russians have pulled out, and we’re sort of the last ones still trying to push the route. 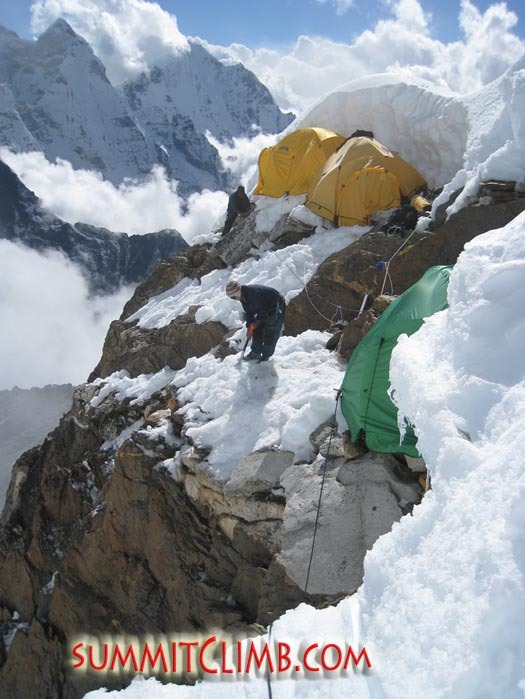 Hopefully our sherpas can safely get the ropes fixed for us up to camp 3, then on to the summit. That’s what we’re trying to find out right now. We’ll know more on Monday. 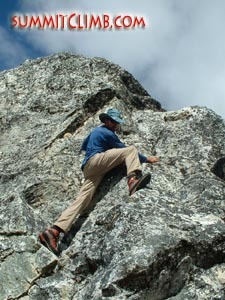 Climbing the rock slabs between camp 1 and camp 2. Climbers approaching camp 1(Nikos Daniilidis). Hi, this is Brent Korte of the SummitClimb Ama Dablam expedition calling in from basecamp for the 17th of October with some more details. Most members have made it to camp 2. A couple of members are still heading up there. Conditions are not allowing us to get any further than camp 2. The sherpas are doing a great job for us though. They climb faster than I think I’ve ever seen anyone climb, which is very impressive. These guys are definitely the heroes. The route is unfortunately not in right now. There are some questions whether the route will be in at all. Everyone is trying to keep positive. In the meantime we are moving around between camp 2, camp 1, ABC, and basecamp. We’ve also been enjoying some delicious meals prepared by our awesome kitchen staff and trying to keep hydrated. We had a near yak tent collision today, which was definitely the talk of basecamp. 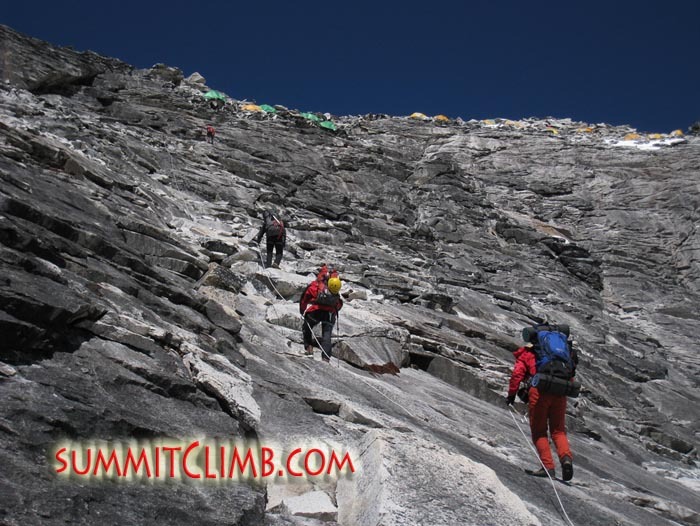 Other than that, we will keep our fingers crossed that our sherpas can climb safe and get up above camp 3. 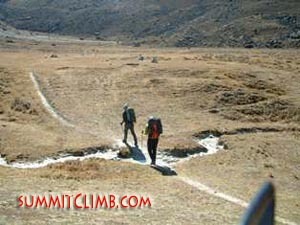 Once above camp 3, they will probably crack the route and it will be time to start hitting the summit. Hi, this is Jason Thomas the leader of the SummitClimb Ama Dablam expedition calling in from basecamp for the 16th of October. Everybody is doing well. We’re still trying to get the lines fixed on the route. The sherpas were up there 2 days ago and found some tough conditions, but they are going to go back up in the next couple of days and try to fix the upper route again. Other than that, everyone is doing well. There are a bunch of new climbers in basecamp. Two members are up acclimatizing still. Everybody else has already been up to camp 2 and we’re just waiting for the route to get fixed. One of our members, Nikos, decided to leave, so he is heading out right now. He’s on his way to Namche today and he should be in Lukla tomorrow and hopefully Kathmandu the next day. We’re all sad to see him go, but he fulfilled his Himalayan dream. Our advanced basecamp at 5500 metres/18,150 feet. We have a cook here who prepares hot drinks and food to keep us healthy (Chris Kinny). Groups in ABC, camp 1 and camp 2. Hi, this is Jason Thomas the leader of the SummitClimb Ama Dablam expedition calling in from ABC for the 15th of October. There are 4 members and me in advanced basecamp. There are 6 members up at camp 1. 3 of those have gone to camp 2 and the other 3 will be going up to camp 2 tomorrow. The members I’m with and I are going to move up to camp 1. The rest of the members are down in basecamp resting and having a good time. They’ve spent a couple of days up high, so they deserve it. Everything is going well. It’s been a tough season so far on Ama Dablam. Nobody has summited. The Italian team had been pushing the route and fixing a lot of the rope, but they decided to leave. They ended up cutting all of the rope and taking it with them. So we have put our sherpa team up there today and they’ve done a really good job, pushing way up towards camp 3. We’re hoping over the next couple of days we’ll get it fixed up to camp 3, on to summit, and we can start sending teams up. Groups in camp 1 and camp 2. 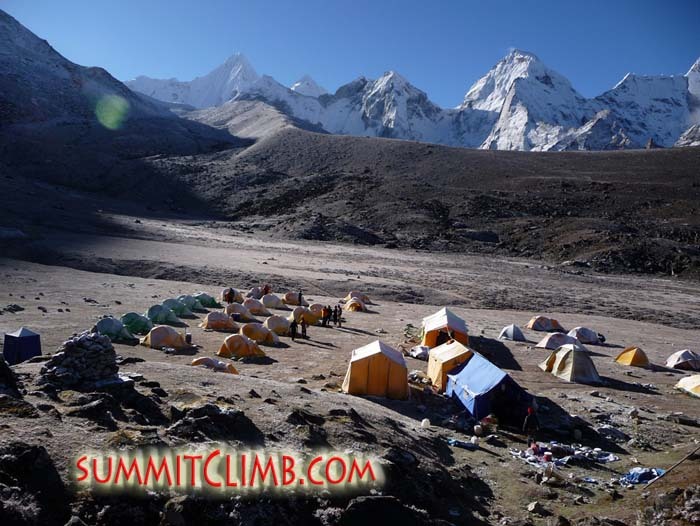 Hi SummitClimb news. 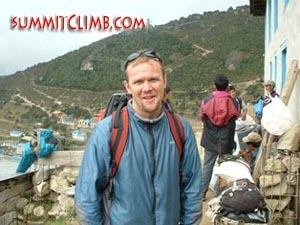 This is Tony Kortens calling in for the SummitClimb 2008 Ama Dablam expedition. A few of us came down to Tengboche today to send emails because we’ve having some satellite phone problems, but we’re now back in basecamp. We’ve got one team at camp 1, who are going to tag camp 2 tomorrow. 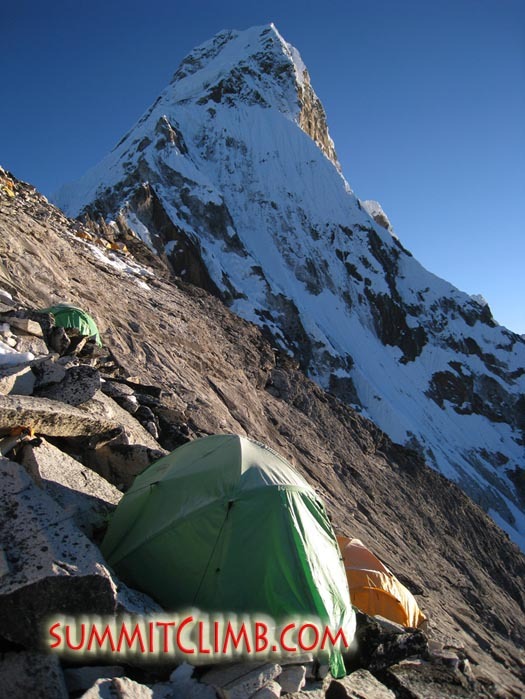 The sherpas have got a couple of tents up at camp 2 and are going to be exploring the route above. The Italian team has tried to push the route above camp 2 so far. There are a few of us going up to ABC, camp 1, and camp 2 again tomorrow, so there is sort of a rotation between 3 groups getting up to high altitude and waiting for the route to be fixed. We’re hoping the sherpas are going to be able to continue where the Italians left off on the Grey Tower. Apparently, there is a lot of snow on the Grey Tower and that’s causing some slowdowns there. The moon was just rising above to the right of Ama Dablam. It looked absolutely glorious and I managed to get a few photographs. We’ve got a lot of people up here at basecamp now. There are a lot of teams camped near us in basecamp and ABC, with more arriving soon. It’s getting very busy with lots of tents, yaks and people moving around. We had a great dinner again. The head cook at basecamp is treating us really well. Reinhold has a done a massive reorganization of the team’s medical kit. Rea is keeping herself busy by listening to music while Jeanot, her husband, is up on the mountain. Ama Dablam in the morning (Nikos Daniilidis). Ama Dablam seen along the approach trek to basecamp (Nikos Daniilidis). 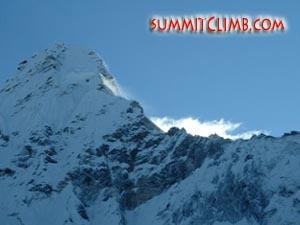 Hello SummitClimb news readers. Apologies to everyone. We have been having some technical problems with our satellite telephone and haven't been able to report for the past few days. I am in Tengboche now trying to sort the phone problem out. A lot has happened since the 7th of October. 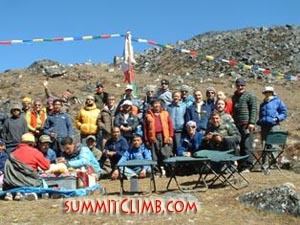 On the the 8th, half of our group carried equipment up to ABC (advanced base camp), came back down and rested on the 9th. The rest of the group carried to ABC on the 10th and we had a puja ceremony. 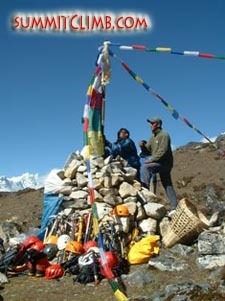 A puja is a Sherpa ceremony that blesses the mountain and the climbers and sherpas. A lama comes to base camp, where he chants and asks permission for us to climb. Our climbing sherpas take this quite seriously and will not climb the mountain until the ceremony has taken place. It was also Pete from England's birthday. The cook made us a nice cake and we celebrated before half the group went back up to ABC to sleep and carry a load to camp 1. The group had a good night at ABC. Some slept more than others, which is to be expected at over 5400 metres/17000 feet. The next morning the group went to camp 1, dropped off equipment and came all the way back to basecamp for some much needed rest. The second team headed up and did pretty much the same thing and returned on the 12th. I had my birthday at ABC on the 11th. On the 12th the cooks made me a cake:) Thanks MOM, I got the message. Also, please, a belated happy birthday to my Grandmother who is now 96! Today seven members headed up to ABC, then camp 1 and on to camp 2. They will be back in basecamp after 2 nights. Other members are resting and will try to do the same over the next few days. No one has summited Ama Dablam yet this year. Snow conditions have been bad, but we are hoping our sherpa team can fix the route without problems. We are getting more and more sun, so we are hoping the snow will consolidate. Some Sad News: Larry one of our teammates had to leave the trip. He fell early on in the trip and possibly cracked a few ribs. We have a couple of doctors on the team and they agreed it was best for him to leave and get checked out in Kathmandu. Larry was a treat to have on the trip, as he is very smart and well traveled. Everyone has expressed how much they miss having him around. I am hoping to get the phone problem sorted out very soon and be able to send daily dispatches again. Thanks for following along. 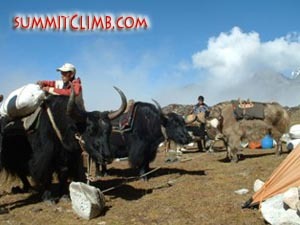 Loading up yaks in basecamp for the trip to ABC (Deha Shrestha). Our awesome climbing staff in ABC (Deha Shrestha). Puja ceremony in ABC (Deha Shrestha). One of our members bouldering in ABC (Deha Shrestha). Our team in ABC (Deha Shrestha). Moving up to advanced basecamp. 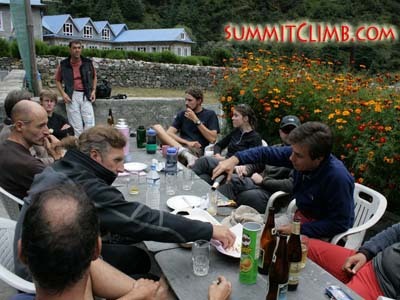 Hi, this is Jeanot Boulet calling in for the SummitClimb Ama Dablam expedition 2008. We are in basecamp and had a rest day today, but also did some training. We went up the hill above camp and installed some fixed ropes to practice using a jumar, rappelling/abseiling, and rescue techniques. 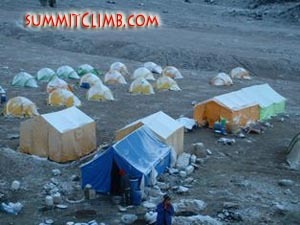 Tomorrow a group of about half the team will go up to advanced basecamp (ABC) and the other group will stay here. Those of us staying here will participate in demonstrations on using the Gamow bag and high altitude hanging stoves. Everything is going fine here, with everyone feeling quite well. We’re going to set up the tents in ABC tomorrow and on Friday we will have a puja ceremony. After the puja ceremony, the sherpas will begin working on the route and we will be able to start establishing the high camps and moving equipment up the mountain. 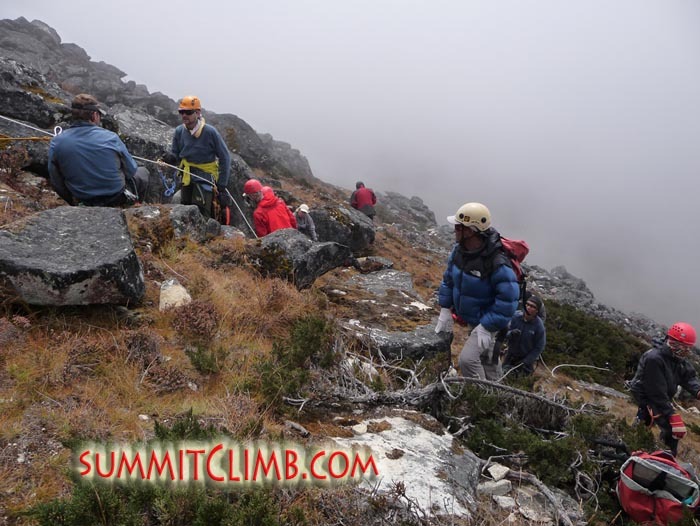 Team trekking up to ABC (Deha Shrestha). Jason Thomas in Pangboche (Deha Shrestha). Reviewing rope techniques in basecamp (Nikos Daniilidis). Our sherpas and team members participating in a puja ceremony in ABC (Deha Shrestha). Team has made it to basecamp. 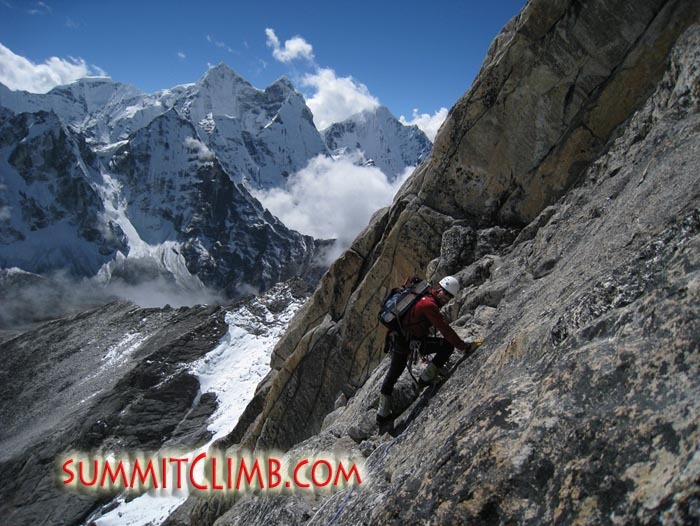 Hi, this is Jason Thomas the leader of the SummitClimb Ama Dablam expedition calling in for the 6th of October. I just want to let everyone know that the whole team has arrived at basecamp and we’re doing well. Yesterday we had a great walk up from Namche to Pangboche. There was a little bit of rain, but it was a pretty good trek. We stopped in the monastery along the way, which was nice. This morning we had some nice, clear weather to start off the day for our hike up to the basecamp of Ama Dablam. There were great views of the mountain, then it clouded up and it’s been cloudy since. We actually had a little bit of hail coming up the mountain getting to base camp. Now it’s just kind of fogged in. We are waiting for our cooks to make some good food for us and then we are going to eat and go to bed. Our comfortable basecamp, located at 4650 metres/15,300 feet, on the grassy valley floor (Deha Shrestha). 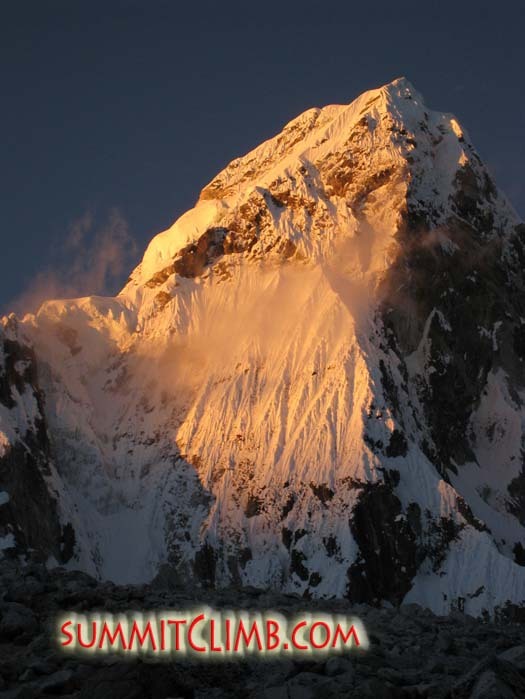 Ama Dablam from basecamp (Deha Shrestha). 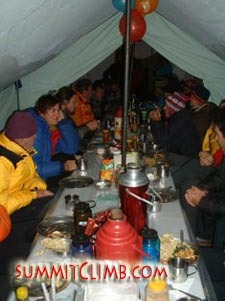 Our group eating a delicious meal in our dining tent in basecamp (Deha Shrestha). 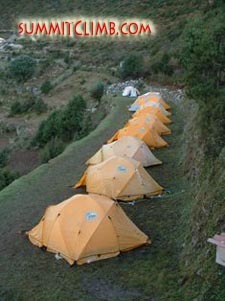 Our trekking tents in Namche Bazaar (Deha Shrestha). This is my first time in Nepal, so everything is new and surprising. Kathmandu is fascinating, but because of a festival at this time, it is very crowded and noisy. Our two teams, the Greeks and the other international members first met there (in Kathmandu) and quickly merged. Mountaineers are kind of a distinctive type, whose members usually get along easily.They have common important matters to share (such as difficult routes they have climbed, bad conditions they have experienced and so on) and that makes them feel familiar. They might even make plans for the future after climbing together. The flight to Lukla was great with views of terraced slopes and scattered tiny villages. We soon caught our first glimpse of the wonderful Himalayan mountains, which no matter how high they are, all look very steep and remote. The landing was a great experience (the runway is very short and has an inclination of maybe 15 degrees).Then our trek began. At the beginning you have a feeling of being in the Alps, the tea houses and lodges are very well built and maintained with flowered gardens. The landscape is beautiful, full of cultivated fields and traditional farmhouses. We all share a fear about how long this traditional lifestyle will last? Our first night was in Phakding. The second night we stayed in Namche in a nice camping site at the top of the village next to a nice but simple lodge, where we all gathered for lunch and dinner. Today was a rest day, but those that could not really stay still decided to walk up to the Everest view lodge, some 300 metres above the village. The trek there was great through thick grassy meadows with plenty of flowers, gentians, edelweiss, amazing butterflies and scattered trees with nice shapes, half lost in the mist, like in the Japanese drawings. We waited for a while on the terrace but Everest did not show. We just saw the village where we will spend the night tomorrow, Pengboche and the great monastery on the way to it, Tengboche. Enjoying lunch together near Namche. Yaks carrying the team's equipment. 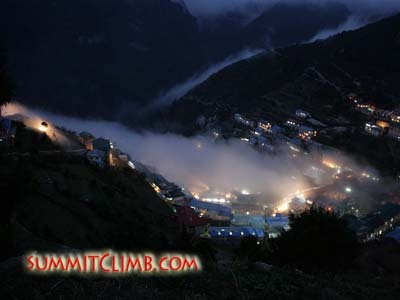 Namche Bazaar in the evening. Namche Bazaar in the morning (Penelope Matsouka). Team has made it to Namche Bazaar. The team has safely arrived in Namche Bazaar, the sherpa capital of the world. Everyone is doing great. We had good weather again today, with just the right mix of sun and clouds. We will spend the rest of today and tomorrow relaxing, shopping, bartering for local crafts and eating delicious food like pizza. Good news! I ran into a guide I know and he was just on Ama Dablam. They were not able to summit, but have fixed the route to camp 2. This will make things much easier for our sherpa team and hopefully they will be able to quickly move up the mountain and get the rest of the route fixed. Temba, one of our cooks, in making a great dinner for us tonight so I have to run. More tomorrow from Namache Bazaar. 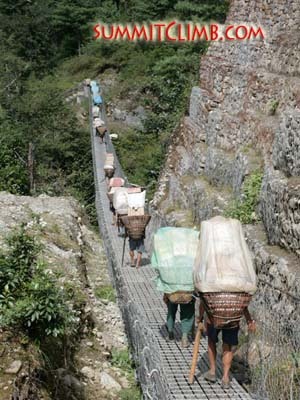 Crossing the bridge along the trek up to Namche Bazaar. 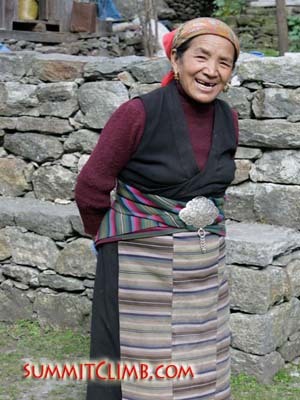 A friendly Sherpa woman smiling. Antonin from the Czech Republic carrying his own equipment for some extra training (Penelope Matsouka). Team has made it to Phakding. Hi, this is Jason Thomas the leader of the SummitClimb Ama Dablam expedition calling in. I’m calling from Phakding at about 2650 metres/8,700 feet. We flew today from Kathmandu at around 8:00 a.m. to Lukla. It was pretty good to get out of there so early and easy. 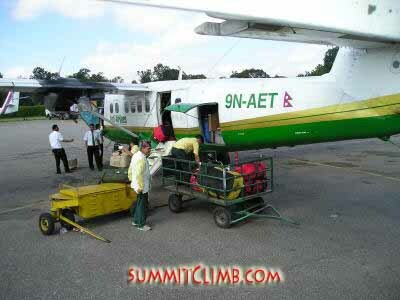 SummitClimb team boarding the plane for Lukla (Dan Mazur). 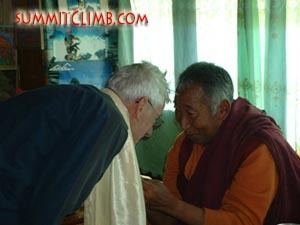 Lama blessing team members in Pangboche (Deha Shrestha). Ama Dablam leader Jason Thomas called in to say that all of the members have arrived safely in Kathmandu. They just had a delicious dinner together and got a chance to meet one another and go over plans. Tomorrow they will have an orientation, pick up any last bits of equipment and supplies, and fly out to Lukla, wether permitting. Thanks for following along our autumn Ama Dabalm expedition and watch for more news dispatches shortly. A view of Swayambhunath Stupa, the "Monkey Temple". 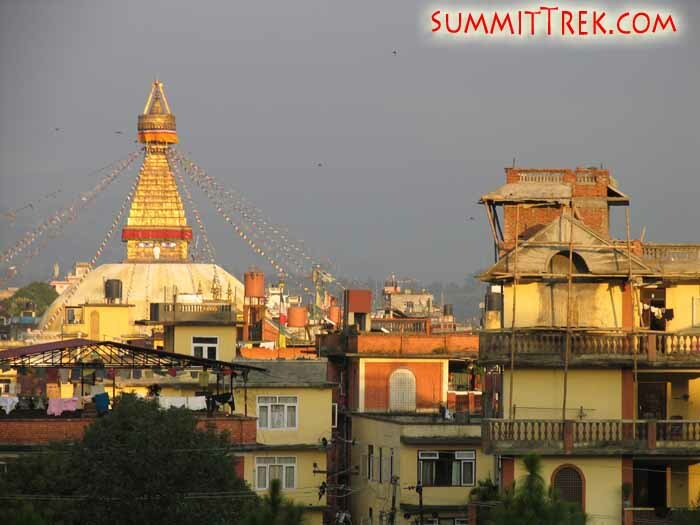 It is the most ancient and enigmatic of all the holy shrines in Kathmandu valley. Swayambhunath's worshippers include Hindus, Vajrayana Buddhists of northern Nepal and Tibet, and the Newari Buddhists of central and southern Nepal. Each morning before dawn, hundreds of pilgrims will ascend the 365 steps that lead up the hill, file past the gilded Vajra (Tibetan: Dorje) and two lions guarding the entrance, and begin a series of clockwise circumambulations of the stupa. On each of the four sides of the main stupa there are a pair of big eyes. These eyes are symbolic of God's all-seeing perspective (Elselien te Hennepe).